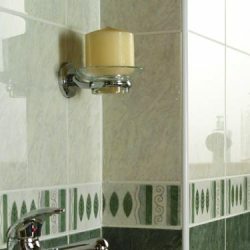 You purchase some very beautiful tile made of porcelain, glass, marble, granite or other natural stone for your bathroom or kitchen, installed it properly and now you are faced with the task of mounting a bathroom or kitchen accessory on that beautiful wall, as shown in Figure 1. The towel bar, shower rod, spice rack or shelf simply says drill holes and use anchors for mounting. Easy for them to say, these materials are extremely hard and require specialized drill bits and hole saws, not to mention a lot of patience to avoid cracking tiles. Drilling holes in ceramic tile. Porcelain, marble, glass, granite, or any of the other natural stones are very hard materials and require diamond tipped drill bits and diamond tipped hole saws to cut through them. Diamonds are one of the hardest materials available and are used to cut through all sorts of material including rock. Its hardness gives it the ability to cut through most materials, however, diamond hole saws and drill bits are not designed to be used on wood or metal. As you can see in the pictures above, the tips of the hole saw and drill bit are coated with tiny diamond particles. 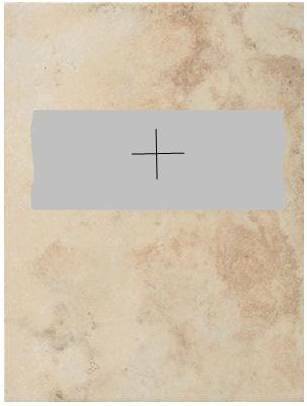 Use duct or masking tape over the surface area of the tile where the hole is to be drilled. This helps to prevent the drill bit from walking when starting to drill the hole. Duct and masking tape is usually easier to write on than the material itself. Measure and mark the location of the holes. Then measure again - you cannot measure to many times! The drill must be held at right angle to the hole to be drilled. There are drill accessories that will aid you in keeping the drill at right angles to the material. Do not attempt to drill on an angle. 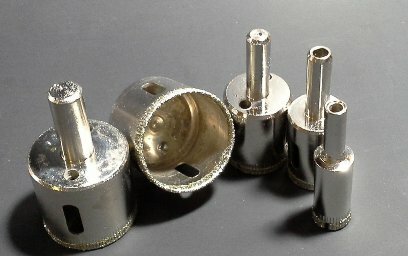 Diamond drill bits are meant to drill using the tip evenly. Drilling on an angle will most likely cause the tile to crack. Use a variable speed drill set on a speed of 100 to 200 rpm. NEVER USE A HAMMER DRILL ON ANY NATURAL STONE, GLASS OR PORCELAIN MATERIAL!. Apply a light pressure to the drill. Applying to much pressure will damage the drill bit or hole saw. Use a cutting oil to keep the drill bit or hole saw cool. Before starting, dip the tip of the drill bit into the cutting oil and during drilling remove the drill bit or hole saw periodically and continue to dip the tip into the cutting oil. This will dramatically prolong the life of the drill bit. Always inspect you drill bits and hole saws prior to use. If the tip or edge is damaged in any manner do not use it as it will most likely cause your material to crack. It is not always possible to pick the location of a hole or group of holes as the location may be defined by the item you are attaching. However, if you can choose the location, always drill as close to the center of any specific tile. The closer you are drilling to an edge, the more chance that the tile will crack. Natural stone such as granite, limestone, and marble have natural fault lines running through them. If at all possible avoid drilling a hole in a fault line. The vibration of the drill bit may cause the fault line to open. 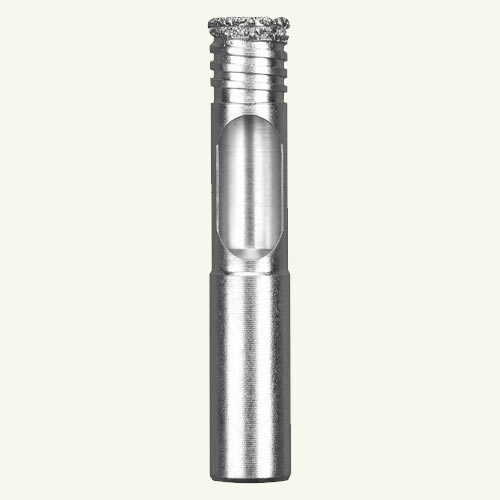 Diamond drill bits do not work will in wood or steel, although they do work well in plaster, concrete board or drywall. If when you drill the hole, penetrate the tile and the material behind the tile you realize that you have hit either a metal or wood wall stud, rather than open wall space - stop drilling immediately and switch to an appropriate drill bit for that material. It is generally wise to use a drill bit one size smaller to avoid having that drill bit attempt to enlarge the hole drilled in the material by the diamond drill bit. Never attempt to use a screw that has a larger outside diameter than the inside diameter of the hole that you have drilled. You cannot thread into porcelain, glass, marble, granite or other natural stone material. 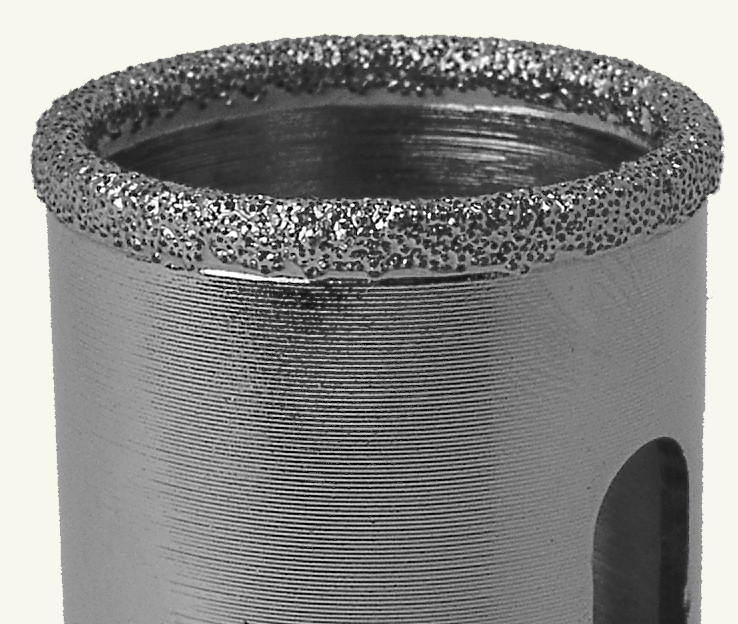 Use an appropriate size and function wall anchor in the hole that you have drilled.